Former Defence Secretary, Gotabaya Rajapaksa has said his US citizenship status was a personal matter to him, which he can decide to keep or relinquish. Mr. Rajapaksa was responding to a number of questions posed by journalists, after appearing before the Permanent High Court Trial at Bar yesterday (17). When asked about claims that he cannot relinquish US citizenship for a period of ten years, Rajapaksa noted that there is no law in place to restrict him in this manner. While noting that the US considers itself the father of liberal democracy, Mr. Rajapaksa stated that they cannot curtail the right of anyone for any reason. 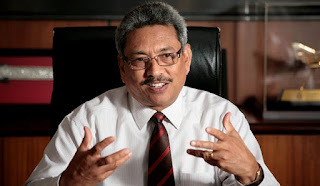 Responding to another query, Gotabaya Rajapaksa reaffirmed his preparedness to run as presidential candidate..
Gotabaya Rajapaksa was present before courts today (January 17) due to the case filed against him and six others over alleged misappropriation of Rs. 33.9 Million in public funds. The money was allegedly utilized for the construction of the D.A. Rajapaksa Memorial and Museum. The case is due to be taken up continuously from the 22nd of this month.